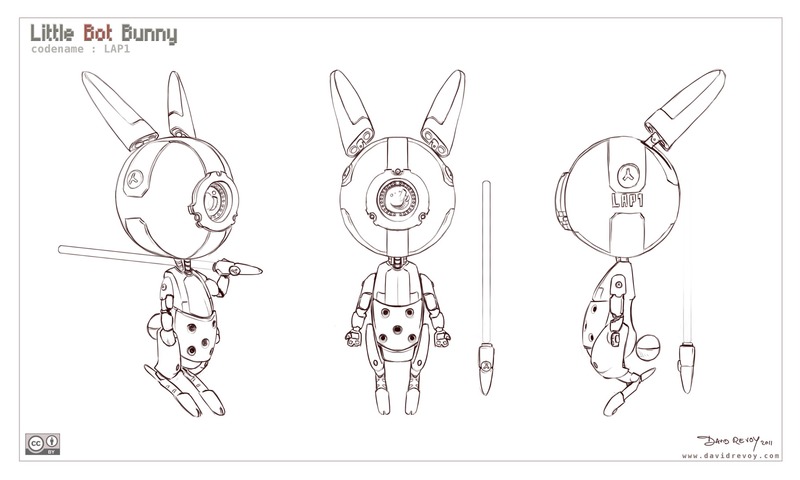 Here a free model-sheet of my cute character 'little bot bunny' ( or LBB, or nicknamed 'Lap1' ). I release him under the Creative Commons By license . In short , this license allow you to share it for free, use it for free on your project ( even commercial ) , do derivative with it, teach how to model or to what you want with it ...etc... ... Only one condition ; you should mention me in your project as the concept-artist and this should be publicly visible (exemple : "concept-art : David Revoy , www.davidrevoy.com" somewere in your credit, or in the bottom description, etc... ). Feel free to use on it the 3D material you want, customise it, pose it as you want: modifications and derivatives are allowed . Exemple : you can do a steampunk version of it rusty with your own design on the top. I did it as a gift you can find bundled with my recent interview in the free PDF magazine 'Blender Art' #35. Feel free to use the comment to post a link to share your result. Have a good modeling time ! License: CC-BY David Revoy, www.davidrevoy.com, 17 november 2011 . Amusant ! :D Et joli design. Feel free to post any images you create of Little Bot Bunny on Blenderart's facebook page. We would love to see them too. I saw this on DA earlier. I love it. 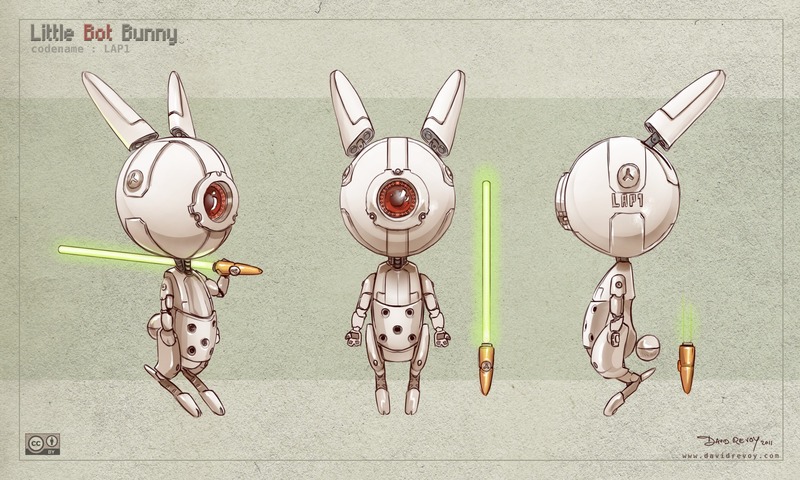 Star Wars Bot Bunny :) Very cute! In OpenSource world do we have some similar magazine like BlenderArt only for 2D artist e.g. GimpArt magazine or maybe MyPaint magazine. I have been subscribing 2DArtist Magazine (www.3dtotal.com) but there is mostly only photoshop tutorials and I would like to jump to away from PS to OpenSource programs. @Konstantin : Hey, No for the moment we are still a little amount of user, and not a lot of contributor community-wise. Ressources to learn 2D open-sources are online tutorial via search engine, or the DVD I did. But all of this is pretty recent. Thanks for sharing, now I need to find time to get back into blender... on top of writing my book, learning to how I can attempt to be as awesome as you, oh yeah and working 60 hour weeks! Looks really nice, I think I will make a 3d model from that sheet, and make the textures this time in gimp, I think I will do it this next week in my free time, I will let you know, thanks again David. I am in love with your Little Bot Bunny, so I decided to send it through Blender to make it more real. cat on keyboard problem ? Good job, I like the flying overboard and the red color!